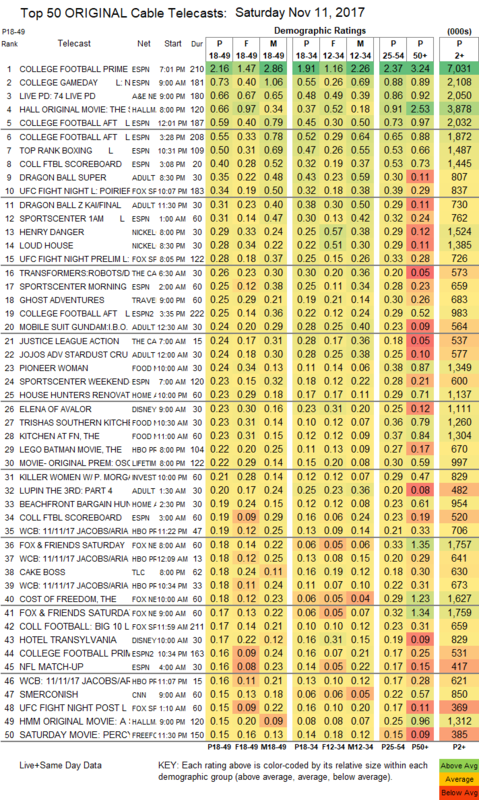 NETWORK FINALS: ABC’s COLLEGE FOOTBALL game adjusted up 0.2 to 2.1, and FOX’s game stayed at 0.8. In addition, DATELINE and the NCIS rerun gained 0.1 in final numbers, while the SUPERSTORE and SNL reruns lost the same. CABLE HIGHLIGHTS: Sports dominated Saturday cable, with ESPN’s COLLEGE FOOTBALL triple-feature at 2.16 (for Alabama vs Miss St)/0.59/0.55. In addition, the network’s TOP RANK BOXING was at 0.50, and Fox Sports 1’s UFC FIGHT NIGHT was at 0.34, with PRELIMS at 0.28, and ESPN2’s afternoon game was at 0.25. (More details about all these ratings can be bound in this week’s SKEDBALL post.) 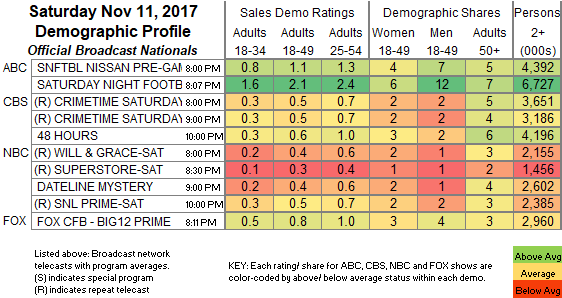 Non-sports programming was led by A&E’s LIVE PD, steady at 0.66. Hallmark’s latest holiday movie THE SWEETEST CHRISTMAS was at 0.66, and Lifetime’s OSCAR PISTORIUS: BLADE RUNNER was at 0.22. Adult Swim’s primetime DRAGON BALL episodes were were up 0.06 to 0.26/550K and up 0.12 to 0.48, and the late-night line-up was as follows: DRAGON BALL up 0.01 to 0.50/893K, and down 0.05 to 0.31, JOJO’S BIZARRE ADVENTURE down 0.01 to 0.30, MOBILE SUIT GUNDAM up 0.01 to 0.29, HUNTER X HUNTER steady at 0.27/531K, LUPIN THE 3RD down 0.07 to 0.20, NARUTO down 0.04 to 0.20/459K, OUTLAW STAR down 0.06 to 0.17/386K, and COWBOY BEBOP at 0.16/358K. Nickelodeon’s primetime pair of HENRY DANGER and LOUD HOUSE were at 0/29/0.28. Cartoon Network’s morning TRANSFORMERS was at 0.26. Travel Channel’s GHOST ADVENTURES held at 0.25. On Food Network, PIONEER WOMAN gained 0.04 to 0.24, TRISHA’S SOUTHERN KITCHEN was at 0.23, KITCHEN AT FN was steady at 0.23, and VALERIE’S HOME COOKING fell 0.06 to 0.14. HGTV’s HOUSE HUNTERS RENOVATION ticked down to 0.23. ID’s KILLER WOMEN was at 0.23, compared to last week’s 0.26/0.21. On OWN, IYANLA, FIX MY LIFE dropped 0.04 to 0.13, and RELEASED was down 0.03 to 0.11. BBCAmerica’s DIRK GENTLY ticked down to 0.06. Ovation’s VERSAILLES held at 0.02/211K.